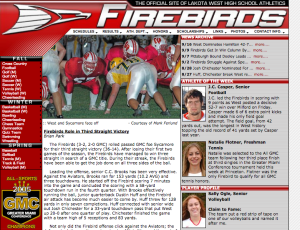 If you’ve reviewed my writeup on the Lakota West main website, then this description of my work on the Athletic’s website will show a clear progression in moving from a technical content management system to a no-knowledge CMS with an administrative interface. 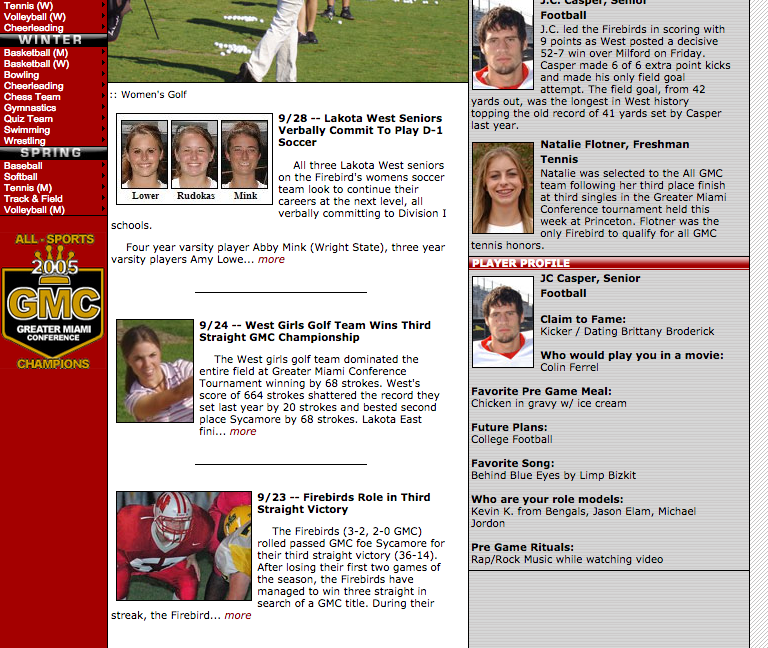 Similar to the high school’s main domain, each athletic team website had a different design and layout, which meant reviewing and searching for information was inconsistent and unorganized. The purpose of the new athletic website was to incorporate the entire athletic program under one website with an organized way of recording and delivering sport-specific content, while showcasing highlights and updates to the athletic program. 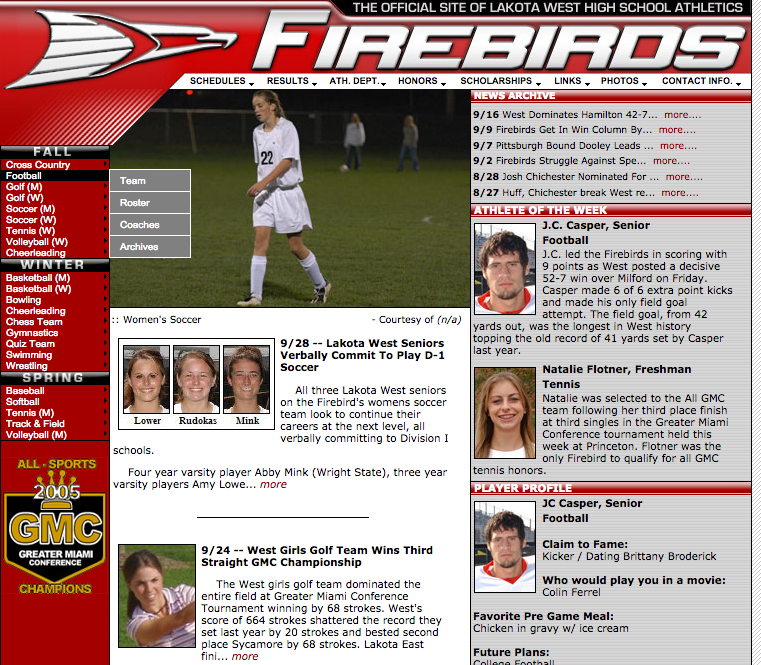 I used a simple navigational concept similar to the main page: a left navigation that provided a quick access to each sport by season, and a top level navigation that provided links weighted by importance to the athletic department that would direct the user, usually, to websites outside the domain of this theme. 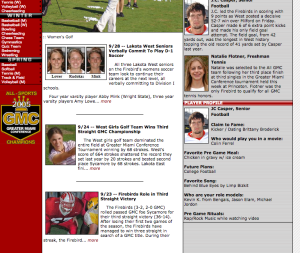 Most of these design choices were from my web design teacher who was a member of the athletic department and had a vision for how to organize the content. Decidedly, the best way to help the user navigate the vast amount of content was to utilize drop down menus. 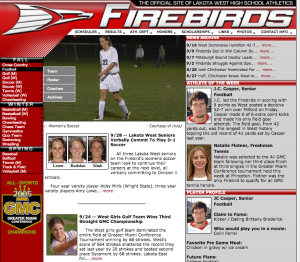 Whenever a new sport needed to be added or removed, the user would just need to add a respective two-character coded folder, and appropriate subpages for the team. The next obstacle was delivering news content on the athletic department. The problem with the news articles was that they were often written by many different people, most of whom had zero technical knowledge which would require each user submitting their article to someone who would then upload it to the website. The goal was to remove the middle man and let writers submit their content directly. Again, trying to maintain a structural integrity, the news articles would maintain a strict theme where the writer would be able to upload one photo that would highlight the article, give the photo a brief caption, and then follow it with a paragraph style text body. Through the administrative form that I created, this would upload their content to a database that would then parse it in a couple of different ways. First, the front page would take the photo, create a thumbnail, and display an introductory snippet of text from the article. This would be done for the first three articles fetched from the database. and then the next six articles would display a snippet of the title to be used in the “News Archive” box in the top right. The next goal was to create an administrative form to showcase individual athletes. This form was an easy photo-upload and text form that requested the student’s name, sport, photo, and a brief text description along with a few silly questions. This data was used in two ways. First, the athlete chosen was designated as an athlete of the week. There would be two athletes each week, one male and one female. These would be displayed all week on the main page with their name, sport, photo, and a brief text description that was submitted. The second use of the data was in a random, rotational “player profile” that would show the student’s name, sport, photo, and the questions that they were asked by the interviewer. Moving from a structural content management system to a more dynamic php based system of uploading and parsing user submitted content was a new level in my growing knowledge of php and MySQL. Indeed, credit goes to the teacher of the course for the flexibility and freedom in exploring ways to tackle the project. 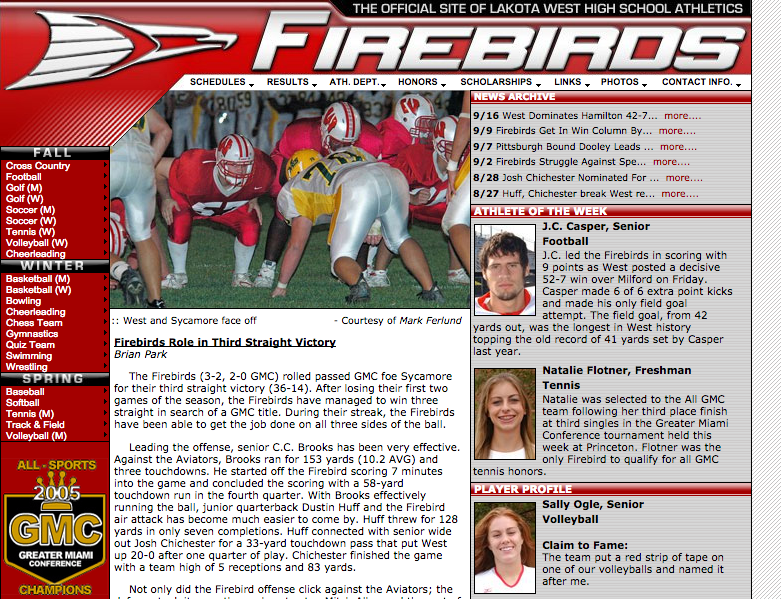 The website is no longer active, but a development copy is available on my server at http://firebirds.newrandom.com.